I have a procrastination problem. The only projects I’ve finished are all client work. And maybe, maybe, we could consider this website as a finished project, in terms of designing it and putting up the main pages. Everything else? They’re all works-in-progress. But today I don’t want to talk about WIPs. I want to talk about social media. Can you start over with digital marketing when all you’ve done is start and stop and try to start over again, only to stop again? What can people like me do to be more consistent with digital marketing? Let me walk you through my plan. Today is the 24th of January, 2018. In an ideal world, I would’ve posted this blog post two weeks ago, not today. Because I had a beautiful, amazing plan to start on the 1st of January, for a flawless 2018. But things happened, and just like any other small business with a tiny team, marketing got put on the backburner. Until now. Step One: Embrace Your Flawsomeness. You’re full of flaws. You procrastinate, you want to do everything but have no time, and you have no idea how you’re going to pull this business thing off. But that’s okay. Flaws are human. Humans are awesome and make awesome things, so you’re flawsome. But to succeed while being flawsome, you need some tools and rules for yourself. Step Two: Establish Some Rules. This game plan is going to assume that you’ve already done all of those worksheets, trainings, workshops, masterclasses, and courses where you identify your ideal clients and where they hang out on the Internet. You know what direction(s) you need to go in. You just haven’t gotten around to getting started because it is SO paralyzing to think of all the things you NEED to do to hit your income goals. This is where rules come in. Rule #1: You start today. No excuses. Rule #2: You don’t need a graphic designer or social media expert. You have Canva, and you can write a few sentences in English. Put together a post and post it. 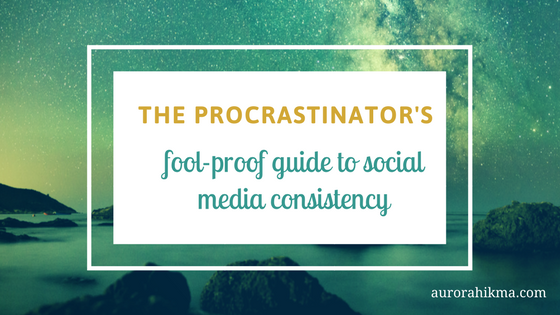 Rule #3: You don’t need to post 10 times a day, on 5 social media networks. You can start with one post today, followed by another tomorrow. The key is to make it a habit. Rule #4: You don’t need to spend 2 hours everyday trying to figure out what photos to use and what words to write. Find 3 – 5 nice photos that suit your business, add text and your logo to them, and use them as TEMPLATES. Change the text based on the post. Rule #5: Be smart with your time. Once you have the first post out there, implement Step Four. Rinse and repeat once a week, or once in two weeks. Rule #6: After you’ve posted consistently for 2 weeks, you can think about making changes and/or working with someone to help you get better at managing your business’s social media. Rule #7: Don’t try to do everything in 2018. Choose one social media network that you’re going to conquer, and FOCUS. Rule #8: If you’ve chosen to grow your Facebook page, but feel like posting on Twitter once in a while, go with your gut if it won’t take more than 5 minutes. These are the rules I’m implementing, and you can modify them to your needs, but they’re the basic ground rules you need to make this game plan work for you. Step Three: Gather Your Tools. You don’t need to pay hundreds of dollars to get your social media up and running. Canva helps non-Photoshop people create awesome graphics, and RecurPost, Buffer, and Hootsuite all have free plans to schedule posts in advance. Actually, Facebook has a scheduler under your page’s Publishing Tools section. Twitter has Tweetdeck. Instagram doesn’t do scheduled posts, not even with third-party platforms, but you can use Buffer, Plann, and Planoly to work around that without risking your account being blocked. You can get beautiful free photos at Unsplash, DeathtotheStockPhoto, and Pexels, among many others. Just Google “free photos no copyright” and you’ll find millions of them. Don’t steal copyrighted photos. It’s not nice and can also ruin your business. This is the most important part of your game plan. Once you’ve posted that first post, you’re going to block out a couple of hours for this, because it’s going to save you a lot of time (and heartache over missed posts). For this you need a spreadsheet, or even a good old-fashioned pen, some paper, and a ruler. First of all, you’re going to brainstorm the different types of posts you’re going to have, and then make a list of the important holidays that you MUST post something related to. Then open your spreadsheet, and create some columns, with headings like Date, Time, Topic, Post, Hashtags, Graphic, and Links. First you fill in all the dates, times, and topics. Then you start putting things into the Post column. Once you have about 2 – 3 weeks’ worth of posts written, focus on the hashtags, graphics, and links that will go with the posts. Depending on how long you’re planning ahead for, you’ll need more time. But 2 weeks (14 posts) shouldn’t take longer than 2 hours to put together, from topic brainstorming to graphics creation, once you have the templates ready. Once you’re done, open whatever tool you chose to schedule your posts, and line them all up in there neatly. Then forget about them for the next two weeks (except for engaging with comments on them). Repeat once every two weeks (or your chosen time period). See? It’s really easy to get organized with this stuff. Let’s get this done!